Recently I've made two pillows. Since they are yet to be gifted, I can't share the front of either pillow. But, I can share the lovely back of pillow #1 complete with zipper. Here is a tutorial on how I installed a zipper into a pillow back of pillow #2. My pillow form is 18 x 18'' and my quilted pillow front is 18'' square. For the back, I took two pieces and lightly quilted - just some straight lines for some texture. The top piece measures 8.5'' high (and has quilted lines running vertically). The bottom piece measures 14.5'' high and has quilted lines running horizontally. Both were 18'' wide. I've used fusible fleece on this pillows pieces. The fleece will show up as white in the photos below. On the top piece, I folded over and pressed roughly 1 3/4 '' to make the flap that will cover the zipper. Using a zipper that was longer than the pillow width, I placed the zipper on the top piece with the zipper facing down and the right side of fabric facing up. You can see my folded pressed crease in the photo. Attach the zipper using the zipper foot on your machine. Flip over and top-stitch. I usually use my regular foot to do this instead of the zipper foot. Go ahead and run a line of stitching along your folded crease at this point as well. Now for the tricky bit. We are going to make the flap and get that zipper tucked inside. Sew another line of stitches along zipper tape. Your are sewing through the zipper, the flap, and the outside of the pillow. Black dashed lines in photo show the stitching line. You want to stay a constant distance from the folded part of the flap. Doesn't it look good in there? Move zipper tab to middle of zipper and trim off zipper ends on both sides. Be careful to keep that zipper tab away from the edges. We'll secure it in another step. Lay zipper face down on bottom of pillow back and pin zipper. Your pillow should be right sides together at this point. Attach zipper. Switch to regular foot and top-stitch. Run a line of stitching along each edge of pillow at the flap to secure zipper. Trim pillow back to meet the dimensions of the pillow front. Trimming gives you the opportunity to adjust where you want the zipper to sit on your pillow. Making sure zipper is left open, place pillow front and back right sides together. Sew around all edges and turn inside out with opening left in zipper. I can't wait to show you the front of this pillow and the other one I made. Both should be gifted next week. Any questions? Just leave a comment. Very elegant zipper finish. Thanks for sharing the "how to" of installing one. One day I will be brave enough to tackle a zipper enclosure for a pillow, so I bookmarked this tutorial for when I need it. Thanks! Thank you for linking up with Tips and Tutorials Tuesday! So much easier than the ones I had to search for on YouTube! I did two pillows last year for my sisters and really struggled with the zippers. 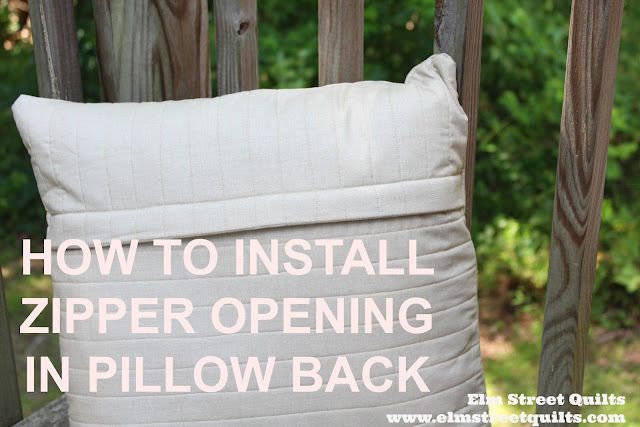 Thanks for the tutorial, this post is a keeper for me, for when I make the pillows for my nieces.